I bought in 2004 this case. Looks like a MacPro? Not realy. But it is keeps my stuff cool. I removed the lower handle (stand). The cas had not a good stand with it. As one posted the Bitfenix lacks stability too. But will I (you) buy a MacProCase and do all fiddling to fit a PC in? I will go this route. I recently bought a Shuttle SZ77R5 (apparently one of the first Shuttle XPC units to support replacing the mobo with a mini ITX mobo). One of my friends kept insisting that it was, at $340, supremely overpriced. On the other hand, it's not just a case, it also comprises a motherboard, power supply, and CPU cooler (although I won't count that since Intel CPUs come with one free). The mobo is expensive, but NewEgg only sells two mini ITX Z77 models. The other one is cheaper, but neither of these have as much connectivity options as the Shuttle (neither has 4 DIMM slots, a second 4x PCIe slot, a miniPCI slot, or an mSATA slot), so it's probably still a fair comparison. What do we get? A fully configured BitFenix would be $344 and still not match the featureset... Suddenly that Shuttle doesn't seem so expensive anymore, does it? I really like the layout of this case. The quality seems to be very good and I personally don't care about the name on the case....as long as the build quality is good. Being able to add my choice of PS is a good feature. I'd be interested in getting this case if it was just a little smaller in size. I'm currently using a modified APEX MI-008 for my WHS. I pulled out the 5.25 drive cage and have four drives suspended in the front. I only need a box large enough to hold the ITX board and HD's. I rip my content on my main system and then load onto the server, so no need for an optical drive in the server. I'll be keeping my eye on this company and their case selection. To be fair, many of the cases that are competitors to this unit also do best with ATX PSUs that are only 140mm long. I think some people with the Lian Li PC-Q11 have been able to use 150mm long PSUs but things start to get really crowded between the front intake fan and the back of the PSU. Having about half of your front intake fan blowing onto the back of the PSU at a distance of 1 cm isn't exactly ideal. With some of their other models, long PSUs will run into the drive cage. So... 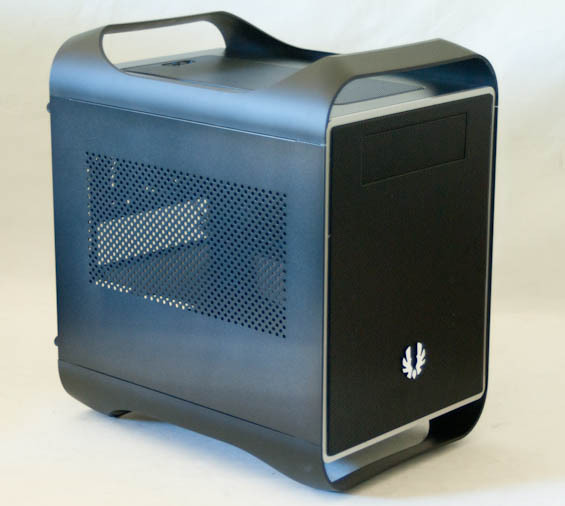 I think BitFenix is going with a PSU length that is typical for many of these cases (though people may still not like that). And yet this probably wouldn't exist if there wasn't some demand for such a product. Clearly somebody wants to build mini-ITX for whatever reason (lowered power consumption, integrated components such as Bluetooth and WiFi adapters) but still have a moderately powerful system, perhaps for home theatre purposes or as a game console/arcade game emulator. Considering all of the Sandy Bridge and Ivy Bridge-based mini-ITX boards available as well as the presence of moderately powerful single slot-width graphics cards such as some revisions of nVidia's GTS 450, this is not only possible but to some extent wanted by consumers, as such things would end production after their first iteration if they weren't commercially successful. As the article mentioned, mATX basically has the same features as ATX at this point with both offering multiple PCI-e slots and numerous slots for additional system memory. For purpose-built systems that don't need large quantities of RAM or multiple graphics cards, RAID controllers, dedicated sound cards, etc, mini-ITX might become the new low-end/mainstream form factor and replace mATX in that regard. I have a heavily modified Travala C138 2Din Mini-ITX enclosure. Now it holds an 80mm Silenex 11dba Intake on the right side, 80mm Silenex 11dba Exhaust on the left side... and a 80mm Silexex 14dba Fan on the low profile heatpiped copper cpu cooler. Upgraded the powersupply to 120W. I shortened/soldered/etc.. all cables for minimum space/folding. It is equipped with the Gigabye H55N motherboard, two Seagate 2.5" 7200pm 500MB harddrives, A clarksdale I5 DualCore HT processor (655K) overclocked to 3.8Ghz, and a Sony slim BlueRay DVD, 8 GBs of Ram. So, I'm looking for a better case. How frustrated I am that I cannot find one that matches mine..... I don't mind going a little bigger... But it seems you go tiny and fanless... or huge with space for 4 to 6 harddrives?